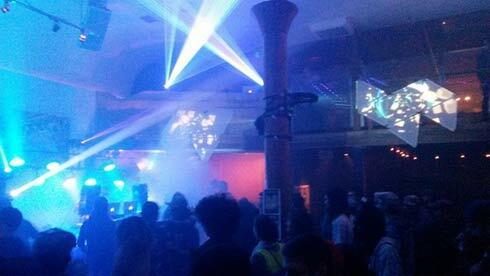 Every Wednesday just outside of Downtown Oakland on 18th st right off of San Pablo ave, you will find a live scene at The New Parish for Wormhole Wednesdays. A serious mix of bass, live instruments and deep drops. You may see Joey Chang aka Cello Joe tearing it up live versus a DJ set or your favorite Drum n Bass DJ. Not to mention art and even live painting. Very Burning Man like. Not only do you get the full sound booming experiences of bass in your face, you also get amazing visual by various local motion graphics artists including Matt Childers of Digital Introspect. The cover is only $5 and the beers are cheap! $3 for a Lagunitas IPA. You can’t beat that at a party like this anywhere in Oakland. Join their Facebook Group for invites to weekly shows and updates on the lineup. If I had to stereo type the crowd I would say “Burners” or just cool people who like bass and wish they could afford Burning Man. Joking, kind of. But a great vibe, cool mellow, drama free people, lot of fun expressive unrestricted dancing and an all around good time. The location is prime, only a few blocks from BART at a spacious lounge with an upstairs, outdoor smoking patio and that has seating and tables with a balcony overlooking the dance floor.